A rare little two tone color film shows a young woman in typical flapper evening attire, modeling her 1920s jewelry. 20th century jewelry is now synonymous with the 1920s flapper. 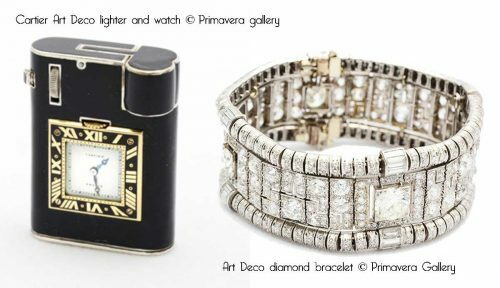 Jewellery in the Great Gatsby Era depicted the modern woman married to geometric designs of automobiles and architecture. The 1920s style is eternally feminine. The Great Gatsby (2013) and Downton Abbey TV series reignited once again the Gatsby party fad. Opulent 1920s beaded evening dresses, jewelry, shoes and head-pieces are now a popular choice for vintage style bridesmaids and weddings as well as any evening event. The exposition of Paris in 1925, titled Style Moderne showcased a huge Art Deco themed collection in design. In jewelry this now extended from traditional accessories like headpieces, necklaces, rings and bracelets to cigarette cases, powder compacts and lipsticks. The layering of necklaces was a particularly big hit. You could never have too little, when it came to ornaments to enhance your wispy 1920s evening dress. The big jewelry names of the Roaring Twenties included Jean Fouquet, Raymond Templier, Cartier, Paul Brandt and Van Cleef & Arpels. Gone were the intricacies of the Art Nouveau style. 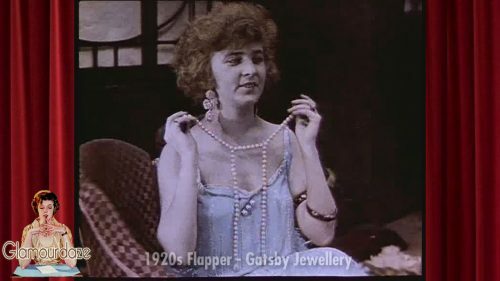 Now flapper jewelry was all about angular lines. The favored metal was platinum. It was strong and durable and held fast the popular large natural stones like jade, ivory, silver and onyx. After WW1 Jacques Cartier was the leading light in adopting Art Deco and mixing it up with Asian designs and stones. A Cartier item of jewelry is highly collectible these days.